Findmypast keeping quiet about Staffordshire records? Which are the correct census references? The LostCousins newsletter is usually published fortnightly. To access the previous newsletter (dated 1 January 2014) click here, for an index to articles from 2009-10 click here, for a list of articles from 2011 click here and for a list of articles from 2012-13 click here. In the last issue I wrote about the consultation that will determine whether there will be any censuses in the future - so I thought it might interesting to go in the opposite direction and look at the history of censuses. Everyone knows that the first British census was in 1841 - or was it? In fact the first national census was taken in 1801, following the passing of the Census Act, 1800 - and there were further censuses in 1811, 1821, and 1831. Some records from the earliest censuses have survived, purely by chance - and generally give more information than was required. According to the 3rd edition of Local Census Listings by Jeremy Gibson & Mervyn Medlycott there are around 750 parish listings which give names even though (other than in Ireland in 1821 and 1831) the census-takers were not required to collect the names of individuals. Tip: the county Resources pages at the LostCousins forum (which will be opening later this year) give information about surviving census listings, mostly held by local record offices, and in a few cases there are links to online transcriptions. However, the idea of census-taking dates back thousands of years. Many of you will be familiar with the passage in the Gospel of St Luke which refers to a census carried out "when Quirinius was governor of Syria"; this census can be dated to 6-7AD (there are earlier population counts mentioned in the Old Testament). A few years earlier, in 2AD a census in China recorded a population of 59.6 million, but even that wasn't the first recorded census - for that we have to go back 6,000 years. Needing to estimate how much food they needed to feed the population, the Babylonians carried out a census around 4000-3800BC; records were kept on clay tiles - one of which is in the British Museum. From the very beginning censuses were a tool of government - the fact that they have subsequently proved invaluable to family historians (as well as to social and local historians) is fortuitous! Note: findmypast has a transcription of the 1831 Census of Nether Hallam, in Sheffield; Ancestry has surveys of the inhabitants of Perth, Scotland in 1766 and 1773. A number of dogs featured on the 1911 Census - you may recall that a couple of years ago I wrote about Beauty, the dog given by Houdini to fellow illusionist The Great Lafayette, who is recorded as his daughter in the 1911 Census. One of the first dogs to be discovered on the census was Biddy, an Irish terrier, who featured in the findmypast blog in 2010 - you can see the census page here. More recently Derek wrote to tell me that he'd spotted Tiddles the cat in the Bermondsey household of Edward Howes. Aged 4 and born in Bermondsey, Tiddles was described as married and a 'Mouser'. Of course, these entries wouldn't have made it onto the enumerators' summaries, which is why we don't see them in earlier censuses. Modern censuses can also be distorted by misinformation - in 2001 about 400,000 people claimed to be adherents to the Jedi faith, a statistic that was reported by the BBC in 2003 in an article headlined "Census returns of the Jedi". Whether - like me - you've been an Ancestry user for over a decade, or have just taken out your first subscription, there are bound to be features of the website that you've yet to discover. It may only be a small thing, but I find the Quick Links incredibly useful - you'll find them on the home page, but because you have to scroll down to see them it's quite possible you haven’t noticed them before (and you may also find that you need to click Customise your home page first). Creating a Quick Link is easiest if you have two Ancestry tabs open in your browser - I suggest you keep the home page in one tab so that you have access to the list of Quick Links, and use the other tab to navigate to the pages you'd like to have quick access to. Tip: to open a new tab, right-click on any link, such as the Ancestry logo, then select 'Open link in new tab' from the drop-down menu (as at many other sites, clicking the logo in the top left of the screen takes you to the home page). As you can see, my research interests are focused on the London area - yours could well be completely different, and that's why being able to create your own Quick Links is so useful. Tip: the targets of the Quick Links you create don't have to be pages at the Ancestry site - you could, for example, create a link to the latest LostCousins newsletter! Ancestry currently offers two different styles of Search, the New search and the Old search. How do you know which one you're currently using? Simply click here and check what it says in the top right of the page - if it says Go to Old Search then you're currently using the New search - and if it says Go to New Search then you're currently using the Old search. Clicking either of those links will switch you from one search to the other, so it's fairly easy to check out the differences - or at least, it would be but for the fact that when you switch searches the page you're taken to the All Records search page, which I don't recommend using (I'll explain why in a moment). Tip: you can also switch between the two searches by clicking New or Old. When the New search was introduced I (and many others) felt that it was primarily designed to make things easier for beginners, and that in the process Ancestry had made things considerably more difficult for experienced users - in fact, some records were almost impossible to find using the New search. I'm glad to say that Ancestry have listened to users and incorporated into the New search some of the key features of the Old search, so now the disparity isn't nearly as great as it once was. But if you're experiencing difficulty finding a particular record using one search, why not switch and try the other one? You might be in for a pleasant surprise! Whilst it's possible to Search All Records, I hardly ever do - because I know from experience that it won't produce the best results. Why? Because the types of information held in different datasets vary enormously. As a very simple example, if you find someone in the England & Wales death indexes after 1865 you'll know when they were born - because the age at death is given in the indexes - but when you find someone in the birth indexes there's nothing to tell you when they died. If you rely on the All Records search then at best you'll end up searching the records twice - at worst you'll miss records completely. As is so often the case taking the 'lazy' option actually involves more work! Tip: if you're new to Ancestry (or to family history) it is worth starting with the All Records search just to find out what sort of records are available - but switch to searching individual datasets as you discover them. You can choose to search for exact matches or near matches. I'm a little bit sceptical about Ancestry's algorithm for prioritising search results so I prefer to use wildcards and tick the Exact matches only box - you should try both and see which produces the best results for you (remember that more results doesn't mean better results!). Last, but by no means least, the page I find most useful on the Ancestry site is this one. Not only does it list new and updated datasets, it also gives the number of records - from which you may be able to deduce how complete the collection is. This is important, because whilst Ancestry has some parish records from most counties, very few counties are complete - and it's often not clear from the accompanying text what the chances of finding a particular record are. Tip: another way to find out how many records there are in a collection is to use my 'Smith test'. Simply search for the surname Smith - usually the total number of records will be between 50 and 100 times the number of Smiths. Note that the number of search results is only shown when you tick the Exact matches only box. Where there are only transcriptions it's most unlikely that the records are complete, and sometimes it will be only be a small sample. But if there are images of baptism, marriage, and burial registers this indicates that Ancestry has licensed them from the relevant record office - in which case the collection is likely to be virtually complete. However, you do need to bear in mind that many county record offices (Lancashire is a good example) don't hold the registers for the whole of the historic county - it's worth checking the record office website. If you live close to London you might be interested to know that John Hanson (one of the stars of Genealogy in the Sunshine) is running a half day course entitled "Getting the most from the Ancestry website" at the Society of Genealogists on the morning of Saturday 25th January. It costs £20, or £16 if you are a member of the SoG - and there were 9 places still available when I last checked. For more details click here. Just before Christmas an announcement appeared on the Staffordshire Archives website which indicated that an agreement had been signed with findmypast to digitise 3,400 parish registers from 1538-1900, around 250,000 wills and other probate documents for the Diocese of Lichfield and Coventry from 1521-1858, and about 180,000 marriage licences dating from 1617-1900. However, unless I've missed it there hasn't been an announcement from findmypast - there's certainly nothing on their website. According to Staffordshire Archives there are 6 million names to be indexed, and the records should begin appearing in the summer of this year - although I suspect we might have to wait a little longer. Note: there have been big changes at findmypast and its sister companies since Annelies van den Belt was appointed Chief Executive of DC Thomson Family History in August - it will be interesting to see what announcements are forthcoming at Who Do You Think You Are? Live next month. While not everybody left a will, the wills proved by the Prerogative Court of Canterbury represent the largest collection of pre-1858 wills for England and Wales. Prior to 12 January 1858, wills in England and Wales were proved in ecclesiastical courts. This indexed collection contains images of wills as they were copied into the registers of the Prerogative Court of Canterbury (PCC). The PCC, for the most part, handled probates from southern England and Wales, for individuals who owned property in both the Province of York and the Province of Canterbury, or those who died outside of England and Wales. Most of the wills in this collection will be for members of the middle and upper classes. Ancestry has images of just over 1 million wills. You can see some examples of PCC wills free here, at the National Archives website. Earlier this month, possibly for the first time ever, there were special offers at both findmypast and Ancestry - so I got quite a few emails from members asking which site is the best. The simple answer is that there isn't a simple answer. Apart from basic resources like censuses and the GRO indexes there's very little overlap between the records at the two sites - which means that whichever you choose you're going to miss out on the records at the other site. If you can afford subscriptions to both sites then that's the ideal solution - when I'm researching my own family tree I move between the two sites frequently. For example, findmypast is usually the best site for searching the GRO death indexes, but Ancestry has the probate calendars; Ancestry has most of the major military collections for the Great War, but findmypast has by far the best collection of pre-1914 records; findmypast has the parish registers for Hertfordshire and part of Kent, where several of my ancestral lines started out - but Ancestry has most of London, which is where they ended up. But if you really can't afford two subscriptions (even after making savings on your gas, electricity, mobile phone, Internet security software, groceries and goodness knows what else by following Peter's Tips) you're going to have to work out which of the two sites offers the most useful records for your research at this time. It might be as simple as switching from the site you're currently using to the other one, on the basis that for now you've found as much as you can on the site you're with - but it might entail reviewing what each site has to offer, especially in terms of parish records, and comparing this against your current needs. The important thing is to be ready to make a decision, because sometimes there will be a discount offer that only lasts a few days (as with the Ancestry offer in my last newsletter). When you're collecting information about your relatives it's important to record the precise source so that both you and those who come after you can verify the information. For example, it's important to distinguish between parish register entries and entries taken from Bishop's Transcripts - which should be the same but, because human beings are fallible, sometimes aren't - and between information you have personally transcribed from a scanned or microfilmed copy of the register page, and a transcription made by someone else. When you are recording census entries it's crucial to cite the references that will lead others to precisely the same page (which is why the census references are the most important factor when you're entering relatives on your My Ancestors page). Typically the only census reference which is contemporary is the page number - it's the only printed reference. Folio numbers were sequential numbers added at a later date using one of those stamps which automatically increments whenever you use it; piece numbers were also added at a later date - a piece is typically a bundle of books or documents which may or may not be connected. When you're entering relatives on your My Ancestors page make sure you follow the instructions on the Add Ancestor form - and because they vary significantly depending upon the census, it’s particularly important to read them carefully when you're using a census for the first time. However some rules apply to all censuses. If the household you're entering is split over two census pages always use the census references for the first page for the entire household; not only does this mean that the household will be kept as one on your My Ancestors page, it also follows the convention set by FamilySearch, who published the first and, at one time, only transcription of the 1881 Census. If you're using findmypast be very careful - if the family member you search for is on a different page from the head of household the references displayed for the household will be different. Similarly, if you're using Ancestry to search the 1841 Census you'll find that the folio number is often missing and sometimes wrong; at findmypast the book number is missing in approximately one-third of transcriptions. Since you need to refer to the handwritten census page for this census it's a good idea to use it as the source for all the census references - see this article on the FAQs page for some tips..
Once you have the census references it's very easy indeed to find the page again. At findmypast you'll find the census reference search here; at Ancestry you need to select the country (eg England) if you're using the New search - but not if you're using the Old search. Tip: using census reference searches you can quickly and easily check the data on your My Ancestors page - it's so easy that I check thousands of households on members' pages each year. At this time of year there are frequently stocktaking closures at records offices and other archives, so it is a good idea to check the relevant website before planning a visit (indeed I'd recommend doing this at any time of the year). If you were planning to visit Herefordshire Archives you'll have to wait until the end of the year - they are completely closed to the public ahead of relocation to new premises - however their research service continues to operate. A selection of temporary closures includes: Devon Heritage Centre and North Devon Record Office, which are both closed from 3rd February, reopening on 17th and 18th February respectively, and Oxfordshire History Centre, which will be closed from 28th January to 8th February inclusive. In Staffordshire there are plans to close Lichfield Record Office in order to house all of the county's archives in Stafford, but in Dudley the new Archives and Local History Centre opened on 14th January. Note: I don't routinely report temporary closures in the newsletter - when it opens the LostCousins Forum will be the best place to post or look for such information. Almost a quarter of a million people volunteered for the Red Cross during the 1914-18 war, and plans are in hand to digitise all of the index cards held at the organisation's London headquarters, with the first batch becoming available online by August. Appropriately, the Red Cross is recruiting 100 volunteers to help with the project, which is being supported by a grant from the Heritage Lottery Fund. There are some well-known names amongst the volunteers including Vera Brittain, whose autobiographical book Testament of Youth was memorably turned into a BBC series starring Cheryl Campbell (I recently bought the DVD because my wife hadn't seen it). Agatha Miller was another writer who signed up as a volunteer, though you'd undoubtedly be more likely to recognise her under her married surname of Christie. It was during the Great War that she began to write detective stories, to relieve the monotony of working in the dispensary at the Red Cross Hospital in Torquay - no wonder so many of her murder victims were poisoned! You can read more about the digitisation plans in this article from the London Evening Standard. It was 33 years ago that I first met my Californian friend Bob - he became the US distributor for the software business I founded in 1978, and I had the privilege of distributing some of his products in the UK. But whilst we started off as business associates, we soon became good friends and have remained so to this day. Recently he sent me a link to some wonderful images which combine colour pictures of modern-day San Francisco with black and white photographs taken at the time of the 1906 San Francisco earthquake - and I found them so fascinating that I wondered whether anyone had attempted to do the same for London or any of the other great cities of the British Isles. Do take a look and see if you find them as inspirational as I did! Although you might get the impression that I spend my days reading genealogical mystery novels, writing this newsletter involves a lot of background research, and last year I was delighted to discover Family Matters - A History of Genealogy which puts a lot of things into perspective. Indeed, it was through reading Michael Sharpe's excellent book that I discovered that the problems we're having dragging the General Register Office into the 21st century are nothing new - much the same was being said 100 years ago! Before Christmas I met with the author, who is not only a LostCousins member of some long-standing, but also a professional genealogist and writer. 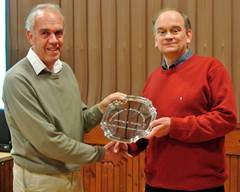 He was recently awarded the Markwell Memorial Award by the Birmingham & Midland Society for Genealogy and Heraldry - the photo below shows Bernie McLean, the chairman of the society, presenting the award to Mike (on the right in the picture). Peter: What inspired you to write a history of genealogy? Michael: I've been a family historian for thirty years, long enough to remember how things used to be done. Obviously, computers and the internet have changed genealogy a lot and I thought it would be interesting to write about that. As I looked further I found not only had no-one really written about those changes, but that the whole history of this field was largely undocumented. For people who study the past, genealogists have a rather poor understanding of their own origins. So it felt like the time was right for someone to draw those threads together. Peter: It's apparent from your book that many of the early genealogists were more interested in producing the answers that they (or their employers) wanted rather than finding the truth. Do you think that modern researchers sometimes place too much credence in older pedigrees? Michael: I’m not sure about that. To link into the older pedigrees associated with the early genealogists researchers would have to go quite far back (generally into the 18th century) and quite far up the social scale, because only the nobility and gentry could afford to have their ancestry documented. However, we have a similar issue today with online pedigrees. I see family trees on commercial websites that are clearly wrong or have few or no sources, yet the same information gets replicated numerous times. This is not to disparage those who only research online. Family history should be accessible to everyone. But people have to learn the importance of providing evidence and citing sources. Peter: If you could transport yourself to any of the periods you've written about, which one would it be, and which figure from the world of genealogy would you most like to meet? Michael: A key period in British genealogy was leading up to and following the formation of the Society of Genealogists in 1911. This Society brought serious genealogists together for the first time to discuss their common interests and was a spur to a number of genealogy projects. One of the characters who most impressed me was George Sherwood. He was the SoG’s first secretary and a great campaigner for the preservation, indexing and transcribing of genealogical records. In 1913 he petitioned for the General Register Office’s BMD registers to be made more accessible – a battle that has still not been won! Sherwood was a doer and railed against the bureaucracy “which characterises the small person in office”. He remained a driving force in British genealogy until his death in the 1950s and is a much underrated figure. Peter: The Internet is still a relatively new influence. How would you like to see genealogy change over the next 10 or 20 years? Michael: I’m not sure anyone can look that far ahead. As you say, the internet is the big story and we’re still at the early stages there. At present, the large players are carving things up between them and turning family historians into consumers in the process. There is a risk that we lose the community spirit that has sustained genealogy in the past through the likes of family history societies. Social media, such as Facebook, Twitter and LinkedIn, provide a means for societies to fight back, but most don’t have the skills or motivation to do so. I really fear for the future of many local societies. Further ahead, of course, developments in genetic genealogy are very exciting. But as a DNA enthusiast, Peter, you probably know more about that than I do. Peter: Will there be a "Family Matters - Volume 2" one day? Michael: Of course today’s news becomes tomorrow’s history, so there’s always scope to revisit a subject like this. I intentionally didn’t address some contemporary issues – such as social media and privacy - in detail because the outcomes are not yet clear. It’s good to examine the modern fascination with family history from different angles and I’ve a number of ideas, though I’ve yet to start writing. Peter: Thank you, Mike - it's been great talking to you. Just one tip this time as I'm still not fully fit. Earlier today I spotted an advert for a mobile phone that's easy to use with big buttons and few fancy features, and at under £20 it has to be a bargain, especially since it isn't tied to any network (which means you can choose whichever network you prefer). I should stress that I haven't tried this particular phone myself, but I did buy a similar phone for my late father - connectivity is really important for those who are in care homes or in hospital, but most phones are too small and too complex. Thanks for taking the time to read my newsletter - I hope you find some of the articles and tips useful.